Some nice upgrades on the lego slurry tank that not only look great but also give a broader representation of research on the EVAL-FARMS project and related research. On this view we can see the smaller base board, improved sampling platform, the introduction of an LC-MS into the laboratory area, and a cow with a vet who is treating her for mastitis (though not the syringe). There are also some modifications to the ‘sample’ lab (which doesn’t represent any specific kit); on here you can see the lowered computer and smaller size (to make space for the LC-MS and the cow/vet). From here you can see the crop and grass fields that receive slurry, as well as another view of the sampling platform and LC-MS. You can slso see the now inset air vents on the sample lab. From here you can see some wild plants in the corner behind the tank; there is a rodent hiding among these plants. Following the award of our EVAL-FARMS AMR grant, I have built a lego slurry tank. The tank features a curved-wall construction, with the word ‘Slurry’ on the side, control panel and platform with mini-figure taking a sample with a bucket. I have then taken some artistic license with the laboratory for analysis, with samples in flasks. Have added some mini-figures doing social research, and even a nod to some future research outside the EVAL-FARMS grant, with a mini-figure trying to catch some local ‘wildlife’. Slightly low quality images as I have had to use my iPad. And the real thing, complete with real person taking a sample with a bucket. Today we ran a successful antimicrobial resistance in agriculture (agri-AMR) at University of Nottingham’s annual public engagement activity, May Fest. The activity was fairly simple. The children were looking for bacteria in a “slurry tank”. The slurry tank was a ball pit with plastic balls and some (mostly relevant) giant microbes. One particularly special microbe is the plush GFP E. coli which my wife made which today was acting as a multi-resistant E. coli pathogen. The children were given lab coats, safety glasses and a fishing net, and had to collect samples from the tank to pass to our scientists for analysis. We used a light panel for that. Children were then awarded a prize and/or chocolate cow pats (Montezuma chocolate buttons). We only ran it for two hours and were inundated from start to finish! We had 60 prizes and they all went. The children – including our own – clearly had a lot of fun! We also had some information sheets for the parents about the research that we (a very collective we) do that went down very well and sparked some interesting conversations. Special thanks go to research students Ishan Ajmera and Sankalp Arya for helping out at the stand – they were awesome and I couldn’t have managed without them. Susie Lydon for arranging the stall and provision of ball-pit balls; Cath Rees for provision of giant microbes, SGM poster, safety glasses, adult lab coats and lots of great ideas; and my wife Di Levine for fishing nets and more great ideas; and my own children for their help and lively participation. Action photograph showing the slurry tank and analysis of its content! We returned to Oxley School on a windy day, and the children were certainly more lively than on our first visit (which you can read about here). We had brought along their cultured plates, and prepared for our second round of activities. Before describing the events, I’d like to share why we chose to target upper primary age children. Year 5 (10 year olds) is the penultimate year of primary school. There are a number of reasons. First, 10-ish year old children are a good age to work with in that they already have a reasonable knowledge and capacity to carry out complex tasks, while at the same time still have an enthusiasm that dampens in early teens. Second, we would like to get the children enthusiastic about science before making decisions about specialism – so it is important to address children before making GCSE choices (i.e no older than 13). Third, British primary schools are expected to teach “Working Scientifically” as part of the National Curriculum, that includes planning experiments, measuring and analyzing data and evaluating test results. However, the majority of primary schools lack both the human and material resources to carry out such activities, we we are meeting a genuine need here. Within primary schools, the oldest (Year 6) children are already engaged with high stakes national standardized tests (a shame on our country’s education system) so there is little space for exciting enrichment activity – hence year 5. Finally, we had access to the G&T coordinator at Oxley School to help us devise the lesson plans. As research scientists, with little experience of devising classroom activities for school children, having an experienced teacher to help devise the lessons made an important difference. The hand washing increasing microbial counts is apparently well-known: bacteria become dislodged from dead skin cells that are removed. This was new for me! The cuddly toys were cool. My favourite one was the green one. My favourite part was looking through the microscope and seeing all of the bacteria. I loved it when we looked inside the tent with glow in the dark bacteria in. I also loved the lab coats they made me feel like a proper sciencetist. I also liked it when we put our hands in the culture pot. The gel felt cold and slimy. 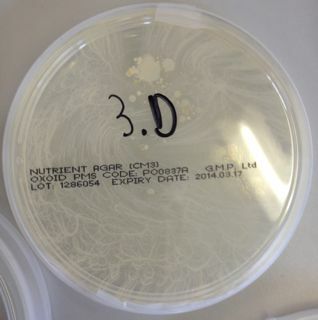 Its mind blowing what sort of bacteria grows on are body. It was very fun grading how disgusting the fungus and bacteria can be. The second week was awsome to, because we did lots of maths. I had the best time ever doing science it was so cool. p.s. tell your boss to consider giving you two a pay rise. 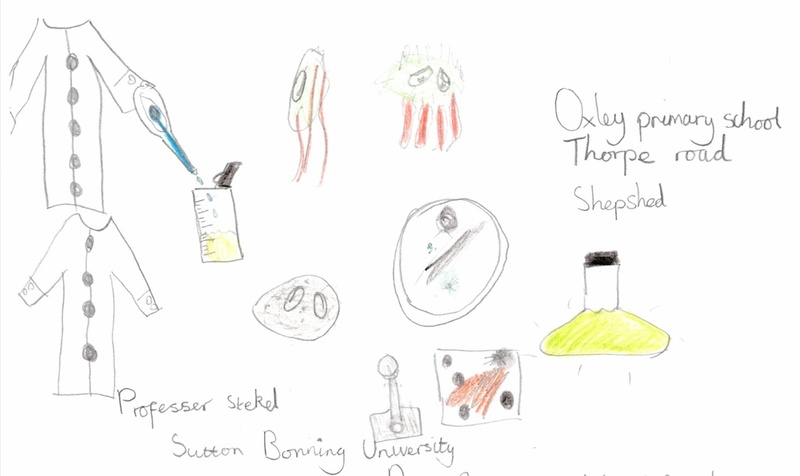 Visit to Oxley Primary School, Shepshed: Outreach / Impact Activity Part 1. To provide children with exciting opportunities to engage with real science in a way that is fun, interesting and relevant to them. To support primary schools in delivering the “working scientifically” elements of the National Curriculum. 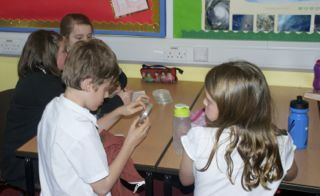 The aim of this week’s visit was to discuss microbes and have the children design and carry out their own microbiology experiment. 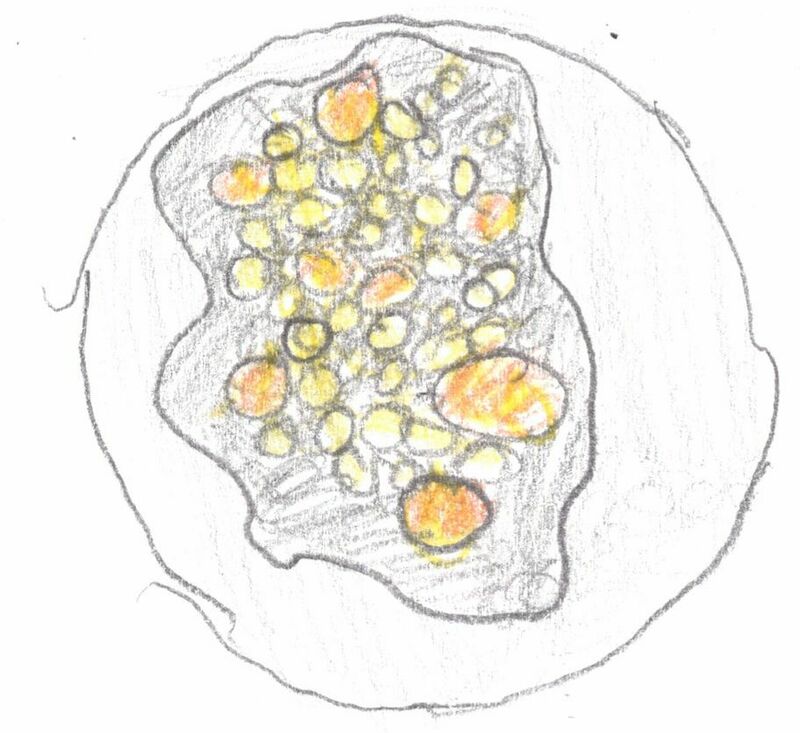 We started with general discussion about what microbes were, showing images of microbes, and discussing also the positive uses of microbes (making bread, chocolate and so forth). We then got more exciting when discussing just how small these microbes are. The giant microbes got passed around (they went down very well!) and this was followed by live images from a microscope with its own digital camera projecting to the interactive white board via USB/laptop. Rhizopus, Saccharomyces, E. coli all went down very well! We then discussed glow-in-the-dark microbes, with suitable reference to the angler fish in Finding Nemo. The children suggested putting their fingers into their noses / ears and put on the plates but we had to veto that for safety grounds (good chance of growing a large dose of something pathogenic). 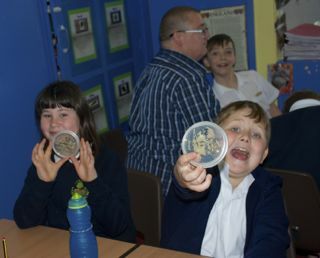 The children of course liked the idea of us bringing back potentially deadly pathogens to their classroom – but obviously not a good idea! 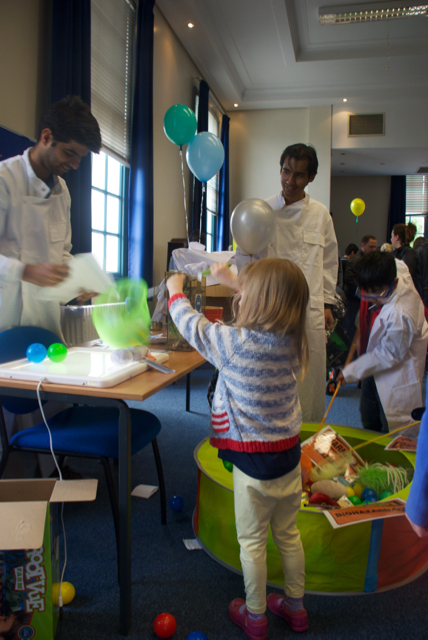 The children loved putting on the lab coats we provided and got stuck in very excitedly. In parallel, we had brought along two flasks of bioluminescent bacteria, a pop-up dark sensory tent, some disposable pipettes and bijoux, and some detox spray. 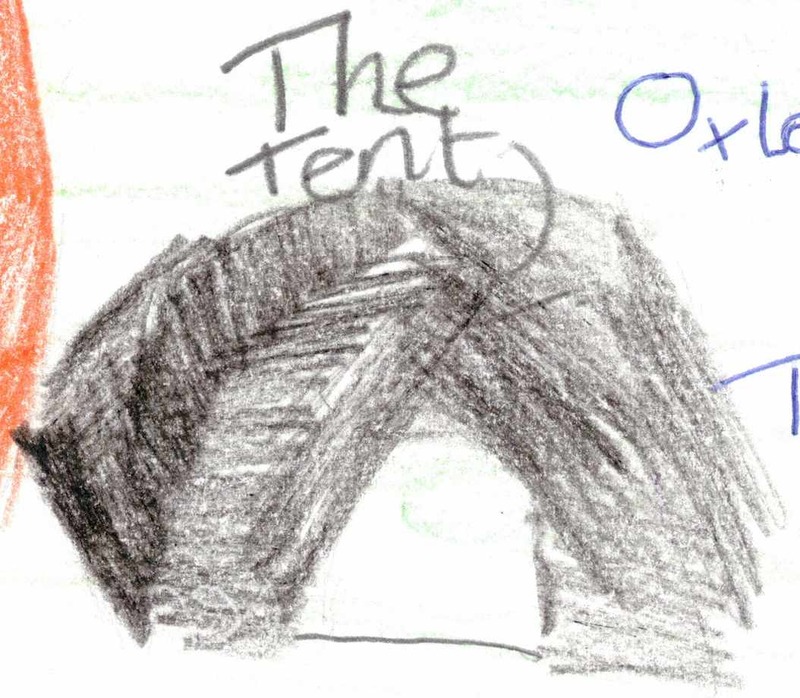 James manned the tent and each child had the chance to go into the tent and see the glow in the dark sample – and confirm that they could be killed by the antibacterial spray (they stopped glowing). Another resounding success. While this was going on, I had many children come to see and use the microscope, and we looked at various prepared slides of bacteria, fungi and even decidedly non-microbial animal hairs. They were quite impressed that they could also see the image on my laptop and on the class screen. The plates will now be incubated at room temperature for a week, and next week we will seal them and bring them back. The plan is to do some data analysis (this is where the maths will come in) and for the children (in groups) to create posters as a form of scientific reporting. This is the link to the blog post for the second week. As a final note I would like to thank again Class Teacher Darryl Morris and Head Teacher Jeanette Hadley for their support and facilitation of these visits. Today I spent the day at the PLoS ONE Editorial Board symposium in London. The meeting was well-attended, with about 50 academic editors and 10 PLoS staff members. The meeting was thoroughly enjoyable and I came away feeling extremely positive about PLoS as an organization and the aims of PLoS ONE in particular. Instead of summarising by session, I will start with the distinctive features of PLoS ONE and how these came up in different talks, and follow with some other interesting other points that came up. PLoS journals are open access. In the traditional model, the publisher is paid subscriptions by universities, libraries or readers to obtain the content. In the open access model, the authors (or in reality their employers or research funders) pay for the cost of publication, and then anyone in the world can read the article. This has the advantage that people outside (wealthy) universities can benefit from research findings. These can include people working in healthcare, SMEs or universities in developing countries. This whole area was nicely discussed in the final session, where Dame Janet Finch told us of her experiences in putting together her report for the UK government on open access publication. It was very interesting to find out that the UK government, HE sector and funding councils are now committed to publishing all publicly funded research in open access format. Importantly, there is realization that universities need to have central pots of money to enable academics to publish in such journals – there are too many problems associated with putting such costs directly into research grants. PLoS is a not-for-profit organisation (in contrast with say Elsevier or Springer). This means that the money they make is being put back into improving their publications – the experience for authors and readers. PLoS is committed to article-level metrics. There was a great deal of material on article-level metrics in the talks. I found this particularly impressive. It was clear that the overall mood among the academics present (and indeed the majority of my colleagues) that judging someone’s work on the basis of the impact factor of the journals in which they have published is entirely inadequate. Yet, promotions, employment and grant panels continue to do this. PLoS are really leading the way by putting metrics on every article: access statistics (HTML, pdf downloads), citations (on a whole array of services), Mendeley inputs etc. Martin Fenner (PLoS’s technical lead on metrics) was rightly nervous about the use of these metrics for things like promotions – and was keen to emphasise their importance in determining which articles are having an ‘impact’. Nonetheless, moves away from an obsession on journal impact factors are most welcome! PLoS ONE is committed to publishing science on the basis of its scientific correctness and clarity of its exposition. Articles that meet these criteria are published, and, importantly, articles are not rejected for not being sufficiently ‘important’ or ‘interesting’. I really like this. What this means is that the community decides what is important – not an editorial office. Combined with article level metrics, it becomes clear which of the articles are ‘hits’ and which are not. Interestingly, the PLoS speakers showed us that the top PLoS ONE articles are having more of an impact than the average articles of their more selective journals. This is partly due to weight of numbers (so many more articles are published in PLoS ONE) but it does show that the philosophy of getting articles ‘out there’ and well indexed and searchable then allows the community to work out what is ‘important’ and ‘interesting’. PLoS connects well with other social media technologies, including Facebook, Twitter, Wikipedia etc. This is also very important. For us scientists to break down the barriers and disseminate our work to a larger and wider audience – and even among other scientists – we do have to embrace social media technologies. For PLoS as publishers to take the lead and use their platform to enable this is a major bonus and shows forward thinking ahead of more traditional publishers rooted in printed media. Overall, the success of PLoS ONE’s model was demonstrated by the considerable rise in numbers of papers submitted and published. These are rising rapidly and steadily: in November, approximately 4000 papers were submitted, and approximately 2000 published. PLoS have published nearly 50000 papers overall. PLoS ONE is already the largest single journal, and with continued rise in papers submitted (and published), PLoS will quickly become a global academic publishing powerhouse. Here, the not-for-profit agenda is very reassuring. The increase in revenues will be ploughed back into improving PLoS journals. On the editing itself, it was interesting to discuss experiences with other editors. What was particularly revealing was that most editors found finding referees the most challenging aspect of editing – a fact known to PLoS. 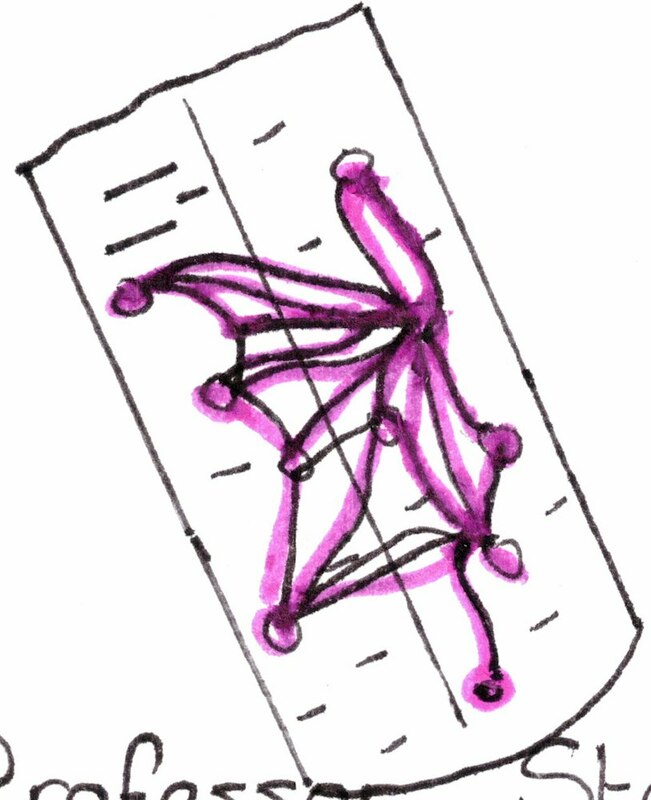 In these discussion, PLoS staff made us aware of JANE – the Journal / Author Name Estimator. What a great tool! Type in an abstract, and it will suggest journals, authors or other relevant papers. For an editor, particularly useful for finding possible referees! Also good if you are thinking of relevant journals for your article – though of course, after today, I am feeling particularly inclined to say to people: publish in PLoS ONE. It is the world’s most exciting journal. The talk that I gave last month on Mathematical Modelling in Biology has now been loaded onto the University of Nottingham’s iTunes U channel! It is in the ‘Knowledge Transfer’ album, which will eventually contain other talks from a lunchtime lecture series aimed at a general audience: these will be released gradually over the next few weeks.